I suspect space exploration is something that's sort of in our nature. Ever since the first humans gazed up at the night sky, our kind mused about what wonders the universe might hold for us. Now, thanks to the power of robotics, we're able to discover those wonders - even if we can't necessarily see them firsthand. Of course, automated interstellar exploration presents its own gallery of challenges, chief of which is locomotion. Scientists have devoted their lives to designing machines capable of making their way across difficult and treacherous alien terrain, but one geographical feature's always left them stumped: sand. Even advanced as they are, NASA's Mars Rovers have been unable to surmount this obstacle - in 2009, Spirit found itself mired in a sand pit; more recently, Curiosity had to take a detour to avoid the same fate. It seems a little bizarre for a multi-million dollar scientific platform to be taken out by something as simple as a sand trap, doesn't it? Then they designed a robot to mimic the snake's movement. To help them along in the process, the researchers turned to MOD-Snake, a machine developed at Carnegie Mellon. Composed of 16 six-centimeter modules and measuring in at a meter long, the robot was originally designed to explore tight spots. Fittingly enough, it was also designed to traverse difficult terrain. "It turns out that they had actually been using the sidewinder gait in their robot for many years to traverse all kinds of ground," explained Georgia Tech Professor Daniel Goldman. "They always had trouble on sandy dune inclines." With a physical model already available to them, the researchers only needed to translate the rattlesnake's movement into data. As it turns out, the way the snake made its way up the inclines by increasing how much of its body was in touch with the ground. It was fairly simple to get the robot to do the same. "Those same waves existed in the robot and allowed it to make its maneuvers and allowed us to modify those waves to make the kind of maneuvers that the snake did on sandy dunes of different inclines, laying down more robot as the hill angle increased," said Goldman. Zoo Atlanta Research Director Joe Mendelson says that, with this new data, the next generation of MOD-Snakes could be deployed either on remote regions of Earth or the frontiers of space. "Robots are expensive. And if a robot gets stuck in the sand that's a problem, especially if that sand happens to be on one or another planet, or a very distant from an exploration post. And we realized going into this, that sidewinders never ever, ever get stuck on sand," said Mendelson. 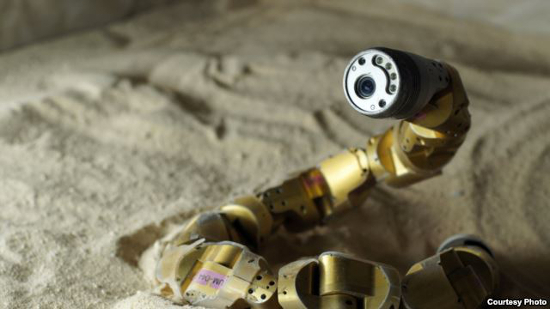 "We hope that our new robot will be able to navigate sand dunes with just as much ease."